Samsung Electronics today announced that it has developed the first Solid State Disk (SSD) based on NAND Flash memory technology. The NAND-based SSD is a low power, lightweight storage media for notebook PCs, sub-notebook PCs and tablet PCs. Using the industry's highest density 8Gb NAND Flash, Samsung can build SSDs with a capacity of up to 16Gb. 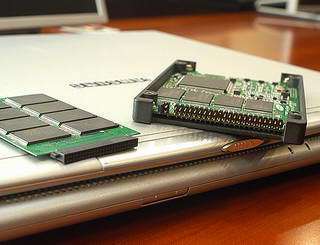 NAND Flash architecture is one of two flash technologies (the other being NOR) used in memory cards such as the CompactFlash cards. It is also used in USB Flash drives, MP3 players, and provides the image storage for digital cameras. NAND is best suited to flash devices requiring high capacity data storage. NAND flash devices offer storage space up to 512-MB and offers faster erase, write, and read capabilities over NOR architecture. The SSD has a power consumption rate less than five percent of today's hard disk drives (HDDs), enabling next generation mobile PCs to extend their battery life by more than 10 percent. The NAND-based SSD weighs less than half that of a comparably sized HDD. Free of moving parts, the Samsung SSD memory has minimal noise and heat emission. Moreover, it is a highly reliable storage media that endures exceptionally well in environments with extreme temperatures and humidity, making it suited for industrial and military applications. The SSD's performance rate exceeds that of a comparably sized HDD by more than 150 percent. The storage disk reads data at 57 MegaBytes per second (MBps) and writes it at 32MBps. The market leader in global NAND flash memory since 2002, Samsung has invested heavily to achieve double-density growth every year, further driving the market to higher memory densities and more affordable pricing. To ensure compatibility, SSDs have been designed to look like HDDs from the outside. Samsung has developed a full line up of SSDs: 2.5-inch type SSDs that carry 16 NAND Flash devices of 4Gbit or 8Gbit density for 8GBytes and 16GByte of storage respectively. 1.8-inch type SSDs will also offer 4GBytes or 8GBytes of density. The 1.8-inch type SSD will be available in August, 2005 for sub-notebook and tablet PCs. Samsung expects NAND flash applications to expand from current applications in digital still cameras (DSCs), MP3 players, and 3G mobile handsets to mobile and digital consumer appliances, as NAND Flash becomes more widely recognized as a reliable, high-density, data storage medium for the widest range of consumer demands.